origami has always been somewhat of a treasured paper art form. for their installation at superstudio corso, color design presented a collection of various patterns and types of wallpapers by cole&son using the age old japanese art of paper folding. 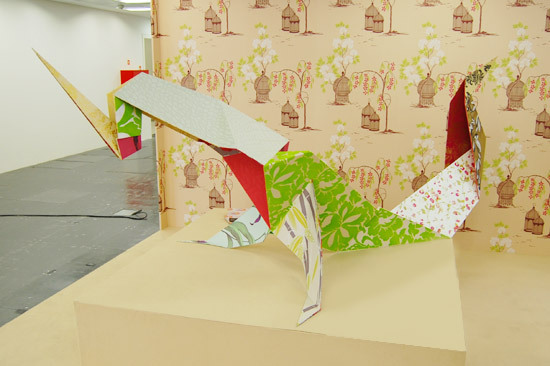 using sheets of the brightly printed wall coverings, they constructed a larger than life version of what looks like an origami reptile or dragon. an unconventional display of wallpaper, each part of the animal’s body presents a different pattern or texture from the collection.